Welcome to the Ink It! Stamp It! Design Team Blog Hop. We hop every month so be sure to pop back and visit us again! Today our theme is the new 2017-2018 Catalogue. 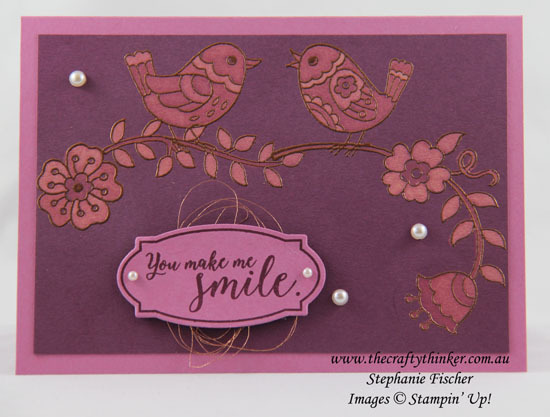 I've chosen to feature one of the gorgeous Hostess stamps called Feathery Friends which I really love. Hostess stamp sets are exclusively available by redeeming Stampin' Rewards from qualifying party sales. To make this card, I stamped with Versamark onto Fresh Fig cardstock and heat embossed with Copper. I then painted inside the heat embossing with household bleach. I achieved various shades by applying more or less bleach. The greeting is from the Colorful Seasons stamp set on a label made with the Rose Wonder stamp set and Rose Garden thinlits. I adhered my decorative piece onto a base card of Sweet Sugarplum. My lovely friend and team mate, Satomi Wellard, was crafting with me as I finished this card and thanks to her very welcome input I added the pearls and the "nest" of Copper Thread. Thank you so much for joining us today. We hope you'll join us again next month to see our Technique related projects. I'm Stephanie Fischer and to keep hopping around, see the list below to see who is up next.